Season 6B: A whole season, a whole era of Doctor Who, created purely to fill in a few critical gaps in the shows’ continuity. Devised by the authors of The Discontinuity Guide (Cornell, Day, and Topping, 1995), this fan theory has been widely regarded and accepted as canon, with the legendary Doctor Who writer and script-editor Terrance Dicks even utilising it for two of his own spin-off novels! Before we look at the proposed season itself, let’s first examine where the gaps in continuity sprung from in the first place. At the end of the epic 10-part story The War Games (1969), the Doctor goes back to his home planet for the first time in the series’ 6-year history. Before that final episode, there was never a mention of Time Lords or any inclination that he had any contact with them prior to leaving Gallifrey in the first place (the Meddling Monk aside). The story ends with the Doctor’s two travelling companions (Jamie and Zoe) having their memories wiped, and returned to their own time streams. The Doctor is then forced to regenerate, before being exiled to Earth for his crimes of interference. There is no inclination that the Second Doctor had any other adventures at the end of this story. As far as the viewer is concerned, the Second Doctor is gone. In The Five Doctors (1983), the Second Doctor has a certain amount of control over the steering of his TARDIS, unlike in his earlier television adventures. Also, during the story, when he comes face to face with phantoms of Jamie and Zoe, he says they can’t be real because they had had their memories erased and wouldn’t remember him. This surely puts the story, from the Second Doctor’s perspective, after the events of The War Games. The Two Doctors (1985) is even more complicated. The Doctor and Jamie, looking much older than they did during their original set of adventures, are under the control of the Time Lords, being sent on missions by them, despite the fact that initially, their first and only meeting with the Time Lords resulted in Jamie’s memory being wiped and the Doctor’s regeneration. Jamie is already fully familiar with the Time Lords, despite never having met them before part 10 of The War Games! “Officially I'm Here Quite Unofficially” or What is Season 6B? In 1995, a trio of dedicated Whovians sought to resolve this continuity mess, by combining what little evidence there is on screen with their own imaginations. Hence the birth of Season 6B! According to Paul Cornell, via Twitter of all places, the 6B theory was born out of the mystery behind the wood-panelled control room in The Masque of Mandragora (1976) – which featured the Second Doctor’s recorder on its console - and the mess of inconsistency that is The Two Doctors. Here then, I will lay out the proposed timeline of Season 6B, in chronological order so that it will be easier to follow. I will highlight where the elements of 6B fit into established Who-lore, and I will include some of my own speculations. Then, I will delve into why some of the continuity errors listed above may have occurred in the first place. This will be followed by a brief look at the ‘original Season 6B’ – a comic strip featuring the Second Doctor published and set after The War Games, but before Jon Pertwee’s debut in Spearhead from Space (1970)! Our story starts with the Celestial Intervention Agency. This agency was a covert group of Time Lords put together to protect the Time Lords’ interests. Various spin-off novels and short stories describe them as spies and potential traitors, whose motives are deeply hidden and secretive. During the Doctor’s trial in The War Games, speculation suggests that the CIA were involved, and that although the Doctor was ‘officially’ exiled to Earth and regenerated, they used him in his Second persona to do a few missions and jobs for them first. The CIA’s involvement was suggested because of the actor Bernard Horsfall, who appeared both as an unnamed Time Lord during the Doctor’s trial, and as Chancellor Goth in The Deadly Assassin (1976), a part-time agent of the CIA. It is suggested that Horsfall could have been playing the same character in both stories, therefore ‘proving’ CIA involvement. So, the Doctor isn’t regenerated or exiled. Instead, he is given back his TARDIS and assigned certain missions to put a halt to issues that threaten both the Time Lords and the Universe. It could be suggested that during these early stages of his ‘freedom’, the Doctor uses the wood-panelled console we see in …Mandragora, as there is nothing on-screen to disprove this theory. We then come to The Five Doctors, where the Doctor is able to steer his TARDIS, something he was unable to do during his years as a renegade. I, however, put forth the suggestion that when the Doctor visits the Brigadier in this story, the CIA may have brought him there deliberately, in order to take part in the events that follow. The Doctor may have been unaware of their involvement, and his capture by Borusa deemed another of his unfortunate coincidences. Also, him being aware of Jamie and Zoe’s memories being wiped, later in the story, shows that at this time he has no companions travelling with him, and puts the story into context in terms of the 6B Season. I am, for the purpose of this article, focussing almost wholly on television stories, as the wealth of spin-off fiction regarding 6B is too wide and complex! However, the novel World Game (2005) is set explicitly during season 6B, has a brief recap of the Second Doctor’s trial, and shows what happens next. Furthermore, as well as being an official BBC Book, it is also written by Terrance Dicks himself! The reason I present World Game next in this chronology is because it explains why the Doctor gets Jamie back as a companion, bridging a neat gap between the Five and Two Doctors stories. Dicks proposes that the Doctor works better with a companion, so the CIA let him have Jamie back. But Jamie has had his memories altered slightly, believing that Victoria has been travelling with him and the Doctor again when she hasn’t. The Doctor mentioning Victoria learning graphology in the latter multi-Doctor story is merely to keep up appearances, keep Jamie thinking she’s out there somewhere. As this is a novel, rather than a televised story, nobody can be sure of whether it can be counted as canon or not. Some fans may disregard World Game, while others may embrace it. A Doctor Who veteran, embracing a fan-made theory and using it to tidy up some continuity errors…I personally adore it! There’s even mention of the Doctor getting a streak of grey in his hair due to the stress! Now that World Game has revealed why the Doctor has gone grey, why he is doing missions for the CIA, and why Jamie is back with him, within the context of Season 6B, The Two Doctors suddenly makes a lot more sense. Indeed, the lovely quote, “Officially, I’m here quite unofficially!” (The Two Doctors, Part One, Robert Holmes, 1985) sums up not only that particular story, but the season as a whole. It is a much more entertaining story when viewed from a 6B perspective, with everything falling into an ‘unofficial’ place. Once again though, some speculation is required. We have to assume the Doctor has now stopped using that wooden control room, and has now moved onto something more akin to what his Fourth persona used. We can also assume that the Time Lords take explicit control of his TARDIS here due to his ‘bending’ of the laws in The Five Doctors (that’s if you ignore my theory about him being brought to the Brigadier deliberately, of course!). So where to from there? The element of 6B arrives in Spearhead from Space, when the Doctor wakes up with a ring, a homing watch, and a bracelet – none of these in his possession at the end of The War Games. But this doesn’t explain why the Doctor ended up here, exiled and earthbound. Did the Time Lords tire of the Second Doctor, and give him his originally proposed punishment in cold blood? I personally like to think that the Second Doctor attempted to sabotage his TARDIS, to escape the shackles of the CIA. This obviously enraged them, and without giving him another chance, delivered the punishment he should have had in the first place. Jamie would have been returned to Earth with his mind wiped, and everything would have been covered up neatly by the CIA. And there you have it. Season 6B. A complicated yet straightforward, confusing yet accessible series of officially unofficial adventures that evolved from a few messy holes and errors in the fiction of the show. Maybe you have your own theories and speculations. Maybe you didn’t even know Season 6B existed until now! Whatever the case, you must remember that it is all theory. I have embraced it, because I’m a huge Two Doctors fan and the theory works. There is nothing onscreen then or now to disprove the Season 6B theory. And when somebody like Terrance Dicks utilises it for his own means…well, surely that’s the ultimate stamp of approval? Whatever the case, Season 6B is just a framework. The tip of the iceberg. A device continuing to built upon. Maybe one day Big Finish will do their own take on Season 6B? Or maybe it should remain distant. Something unique to each and every fan. An ‘undiscovered country’, as Paul Castle wrote for Shooty Dog Thing (6b Or Not 6b?, 2010). Steering the TARDIS, looking a bit older…these are things that can be glossed over or ignored. Little blips that on their own wouldn’t cause much in the way of headaches for fans, and certainly wouldn’t result in home-made seasons and essays on the subject! But why did Terrance Dicks acknowledge, explicitly, the fact that Jamie and Zoe had had their memories wiped? My answer is simply this – plot convenience. When the Third Doctor sees the phantoms of Mike and Liz, he realises that they are fakes by an uneasy feeling he gets. As chilling as the moment is, it doesn’t pack a dramatic punch. The Second Doctor, on the other hand, so close to wandering into a trap, ingeniously remembers that Jamie and Zoe wouldn’t possibly recognise him or the Brigadier, proving them to be ghosts of the mind. It’s more exciting, it shows the Doctor using his intelligence. It works as a scene. This may be why Dicks chose that approach, but then again it might not be. 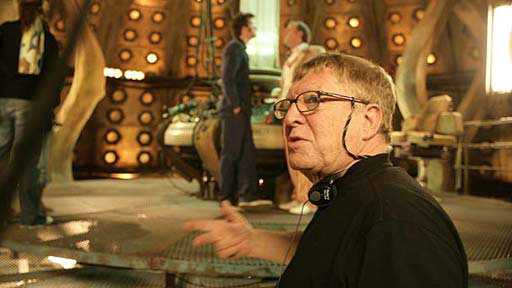 Robert Holmes was one of the strongest writers on Doctor Who, crafting some of the best loved stories of the whole show. So why, then, did he make such explicit continuity errors in his penultimate story? Was he misremembering the past? Having written the Third Doctor’s debut story, he may have wrongly assumed that the Second Doctor had been a Time Lord Agent too. He may have been oblivious to the events of The War Games, having no idea just how little the Time Lords were involved in the series’ earliest years. This doesn’t tally with Holmes’ style at all though. He was well-versed in the shows’ history – indeed, he created a lot of it! Naming Gallifrey and reimagining it as a corrupt regime, writing the first Master story, creating the Autons and Sontarans…The list goes on. Maybe Holmes was consciously shaking up the established past of the show, going out of his way to do something different. It may also have been a simple matter of plot convenience. A ploy to bring the two Doctors together that wouldn’t need much explanation. It’s hard to imagine John-Nathan Turner letting this glaring blip on the continuity map slip by, though. As a producer, JNT was very aware of the shows’ past, as so it must be assumed that despite being aware of the errors in this story, he let them slide. Maybe it was the pull of having the Time Lords involved? Time Lords were traditionally involved in multi-Doctor stories, so maybe nostalgia weighed in his favour? We will never truth. Neither producer nor writer are with us anymore, and so speculation is all that us fans have. Whatever the reasons, we should be grateful that Paul Cornell, Keith Topping and Martin Day came up with the theory in the first place, and that Terrance Dicks liked it so much that he embraced it himself. 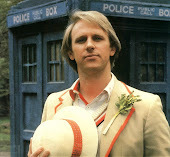 He may not be able to give us answers for his own little blip in The Five Doctors (it was a long time ago! ), but he has gladly filled in the gaps since. I would urge you to watch The Two Doctors again with the 6B theory in your mind, because it is a wonderful, witty story, and one that ought to be appreciated. It would seem that none of the authors of The Discontinuity Guide were influenced by a quaint little comic strip from the 1960’s, but nonetheless, Action In Exile is a little bit of history, very much in-keeping with the eccentric nature of the TV Comic strips. The story was created quite simply because the publishers didn’t want to stop Doctor Who strips while the show wasn’t on the air. And so, in the gap between The War Games and Spearhead from Space, readers of the time were treated to an adventure explicitly set after the Second Doctor’s final bow, in which he is an exile on Earth, having a great many adventures and even becoming a local celebrity! The story ends with the Doctor being captured by some Time Lord-controlled scarecrows, and regenerated…just in time for Jon Pertwee’s on-screen debut just days later! The scarecrows even send the Doctor on one last trip in the TARDIS, leading to the intro of Spearhead where it lands back on Earth. Like many of the TV Comic strips, this story doesn’t really fit into canon due to its’ bizarre nature. However, it is a nice little slice of history that shows a different media format to the TV series carving its’ own little part of continuity, diverting slightly from the established path. I have not yet managed to track down this strip, so if anybody reading this knows where I could acquire a copy, I would be most grateful! I hope you have enjoyed this rather lengthy journey through Season 6B. Perhaps it has inspired you to add your own thoughts and theories to this expanding framework. Maybe it has given you the inclination to create your own theory to explain some continuity error, or the past of a character etc…One thing you must take away from this, more than anything else, is that with an imagination, you can work wonders! #2 Graeme Harper directed it. His 'Doctor Who' debut, 'The Caves of Androzani', was voted as the greatest 'Doctor Who' story of all time, and boasts some of the most gripping action scenes ever seen in '...Who'. He injects 'Time Crash' with the same breathless enthusiasm, and absolutely milks the two lead actors for all they're worth. Nobody could have done it better. #1 Stephen Moffat wrote it. 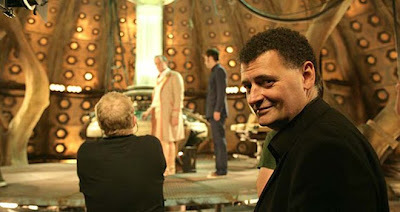 He also wrote 'Blink', 'The Empty Child'/'The Doctor Dances', 'The Girl in the Fireplace', and 'Silence in the Library'. 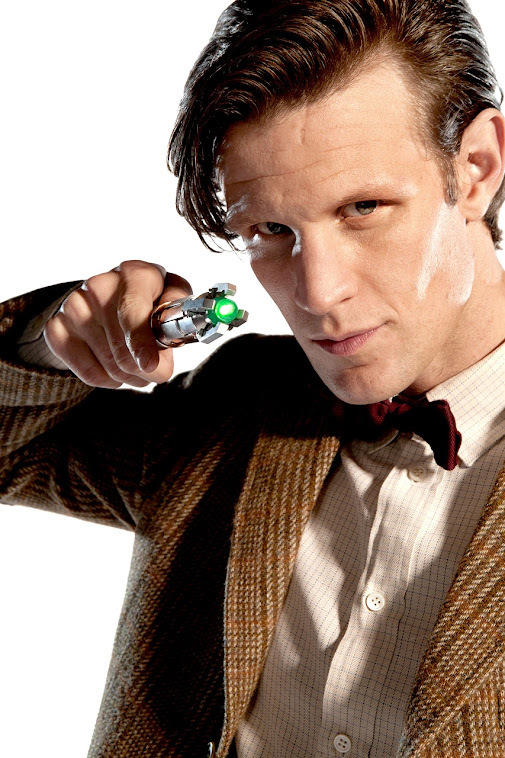 He is now in charge of 'Doctor Who' on television, and is an absolute, grade-A genius. He also cast Matt Smith as the Doctor. She smiled as she ate. Her brother’s face off with a rake. For he’d brought her to despair. She grinned the whole way through. By hanging, as it were. So her corpse would swing with verve. A cold but pretty stiff. They thought they’d have a bit. The Misfits. A cult horror-punk band so influential, their inspiration can be noted from bands as diverse as Metallica, Guns 'N' Roses, and The Red Hot Chilli Peppers. Their grinning Skull logo is instantly recognisable (even though it was nabbed from a Marilyn Monroe movie, along with the band name), and they even have their own fan club. But today, The Misfits aren't 'anywhere near as good as they used to be'. Not since Glenn Danzig left and the band first split back in the 80s. 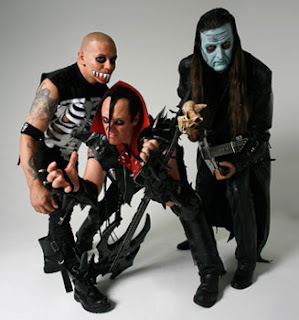 So many die-hard fans disregarded the 90s comeback with new vocalist Michale Graves, and snort with derision at the latest incarnation, which has seen the band's creator and bassist, Jerry Only, singing along to their haunting hymns. Without going into any sort of overlong band-history examination or defence, I'm going to say one thing. Those 'fans' are wrong. The Misfits were great when they came back, and I would argue that now, they're at their peak. The Devil's Rain is the first full-length, original Misfits album for a Hell of a long time. After Graves was booted from the line-up, and Only took over as singer as well as bassist, the band released a rather good covers album of 1950s rock'n'roll songs, and then a 2 track single in 2009 about zombies, before finally unleashing The Devil's Rain upon the world. This new album lacks the raw, ugly aggression of the Danzig era, or the confrontational punk-metal of the Graves era, instead opting for a heavy-sounding rockabilly record. Apart from a few growling instances here and there, Only croons rather than screams, and there's a lack of swearing and overly-violent themes in the lyrics. This is an album more about the music itself than the shock value, an album that is proud to feature all of the horror hallmarks we've come to love from these guys, but with a new level of musicianship and polish rarely before heard in this band. The opening track, and indeed the title track, is a mid-paced, melodic rocker. It's absolutely the right choice for an album opener, drawing the listener in with that thunderstorm sound-effect and the rising sound of the drums. Then the riff kicks in and we're off! It's a ridiculously catchy song, the lyrics no doubt inspired by the old-school horror film of the same name, and it's virtually impossible not to sing along to the chorus. We get a lovely guitar solo, courtesy of Dez Cadena, whose playing on this album is top notch, and a pounding and hypnotic drum beat from Eric Arce that drives the whole song. Straight away, the listener knows what to expect, and those after a 'Last Caress' or 'Attitude' will be extremely let down. Their loss! Things do speed up with 'Vivid Red' though, an edge of thrashy aggression that, alongside the slightly more upbeat 'The Black Hole', wouldn't seem out of place on American Psycho or Famous Monsters. These tracks are separated by re-recordings of the songs from the 2009 EP, Land of the Dead. Both 'Land of the Dead' and 'Twilight of the Dead' are fantastic tracks, and the re-recordings are successful (although I personally prefer the original version of 'Twilight of the Dead'). The songs are catchy, singalong zombie anthems, and listening to them, one has to thank the stars that Jerry Only has retained his love of horror movies over the years in order to keep writing such fun lyrics. It's all uphill from here, too. 'Cold in Hell', 'Unexplained', and 'Curse of the Mummy's Hand' are all heavy rock'n'roll anthems made for the live atmosphere (no surprise that on their latest tour, the band are playing pretty much every track off this album! ), with Cadena really showing off his technical prowess. 'Dark Shadows' (based on the classic TV series and upcoming Tim Burton film) and 'Father' are a pair of Vampire laments that sound so fresh and original, even though Vampires have been done to death just recently. 'Jack the Ripper' picks up the pace a bit, with screeching guitars and aggressive growling from Only, alongside Arce's pounding drums. This is as close to a heavy metal song that The Misfits have probably ever done, sounding like a NWOBHM band in their prime. 'Monkey's Paw' slows things down a bit, essentially a 1950s love song, but about a cursed object that grants three dangerous wishes to its' owner. 'Where Do They Go?' again sounds like a catchy 50s track, with two female backing vocalists adding to the feeling. However, despite the upbeat and nostalgic tone of the song, its' subject matter is actually very dark - Only is singing about the many hundreds, or even thousands, of women found dead or having vanished in the Mexican city of Juarez. Taking something so nasty, and singing about it in such an upbeat way is pure Misfits! Two of the remaining three tracks are, for me, a mixed bag. 'Sleepwalkin'' is catchy enough, but a bit long, and the same can be said for the album closer 'Death Ray', although kudos must go to the band for recreating all those science-fiction sounds. Between these songs, though, is 'The Ghost of Frankenstein'. All I can say is... gorgeous! Catchy, haunting, atmospheric...this is the clincher, the song that proves once and for all that The Misfits are as good, if not better, than ever before. 06. "Curse of the Mummy's Hand"
13. "Where Do They Go?" With all its’ twists and turns. As irrational as that driving warmth burning within. As my mission draws to its' conclusion. Greetings. I am Cory Eadson, the creator of this blog, and I will be sharing with you all sorts of opinions and facts from the deepest, darkest corners of humanity...And Beyond! This Blog will focus on my love of horror movies and novels, heavy metal music, and my biggest obsession: 'Doctor Who', alongside other random nonsense. I may even share some of my own pieces of fiction, for you to absorb and critique.